There are three things about the Kiokee Baptist church history that are totally unique i.e. the longevity of the church, the legacy of the Marshall family and the architecture of the church you see above. In terms of longevity, the congregation of Kiokee has been in continuous service for almost 250 years. Or put in another perspective, the church was founded by Daniel Marshall 17 years before George Washington became our first President. The history of Kiokee is also unique in terms of the legacy of the founding pastors, Daniel Marshall (1706-1784) his son Abraham (1748-1819) and grandson Jabez (1795-1832). The Marshall family thus served Kiokee for 61 years and were instrumental in the organization of the Baptist denomination all across Georgia and the south. Finally, the church is very special in terms of construction technique, quality and architectural style. In order to build the structure you see above, you would have to be highly skilled at brick-making, masonry, carpentry and architectural design. Bricks were very unusual as a building material in this time period due to the fact that it was a highly skilled, time consuming and therefore expensive process requiring an abundance of quality raw material and transportation manpower. 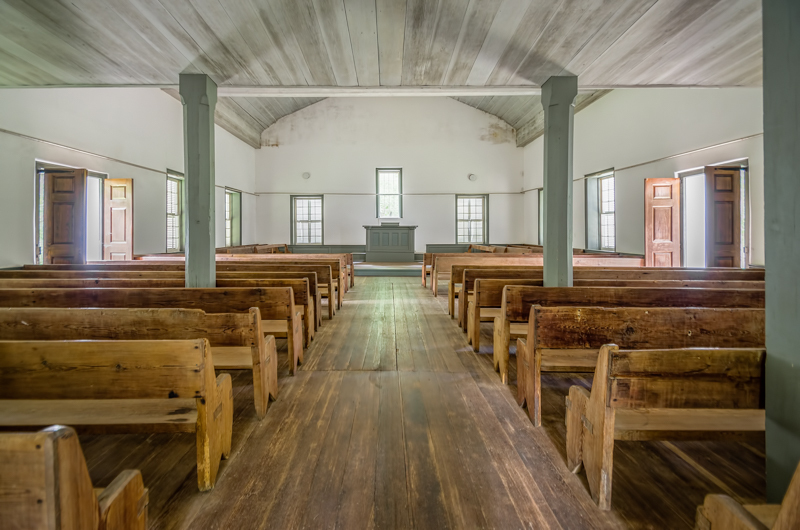 There are only three rural churches made of brick built prior to 1820 in Georgia that we know of i.e. 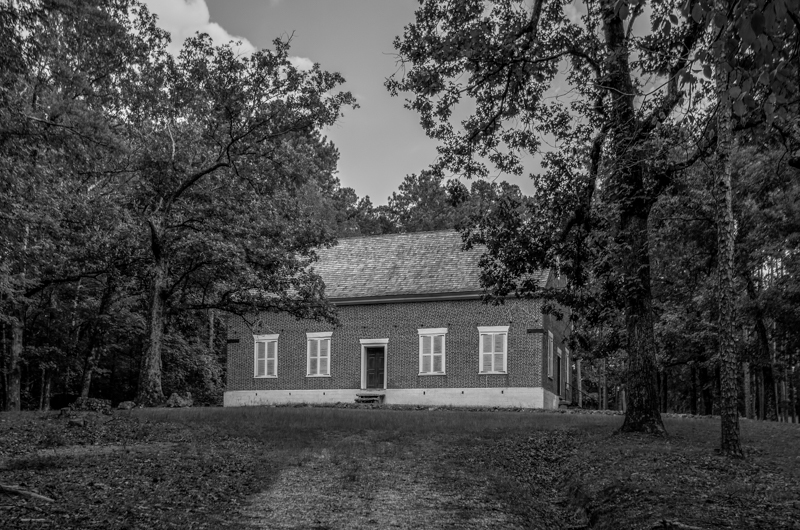 Jerusalem Lutheran in Effingham County (1767), Bethesda Baptist in Greene County (1818) and Kiokee (1808). The little church above is a tribute to a master builder. 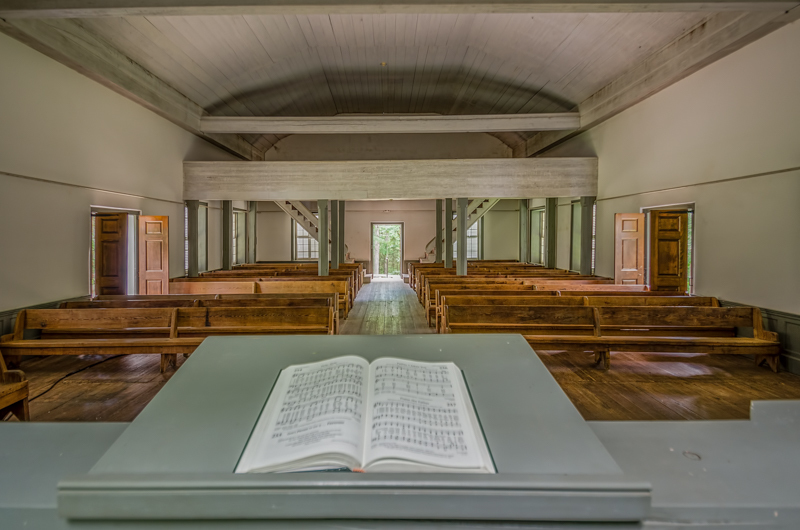 We wish we knew more of the details surrounding the design and construction of Kiokee but one can make some good assumptions based on the realities of what would be required to construct a church like this in an 1808 setting in a remote location in the Georgia backcountry. Regardless of design expertise it would take a lot of very skilled labor. This sanctuary was built by highly skilled tradesmen who were at the top of their craft, and these skills could only be found in the wealthy planter class of these early settlers. We need to keep in mind that great wealth was beginning to be created in this part of Georgia due to the presence of three major economic events, one technical and two social. The technical enabler of the wealth creation was the cotton gin, invented by Eli Whitney in 1794. The social aspect was two fold 1) the huge importation of slaves necessary to manage the labor requirements of the plantation system and 2) the vast amounts of fertile land that had been ‘ceded’ by the Cherokee and Creek nations. Given the fertility of the East Georgia soil and the fact that the Indian cessations had created huge amounts of it at a very low cost, there were fortunes to be made. The little church above is a very good example of some of the best skills this new economic ecosystem had created. King Cotton had arrived in the Georgia backcountry. This is the front entrance to Kiokee Baptist. 'If these steps could talk'… what a tale they would tell. 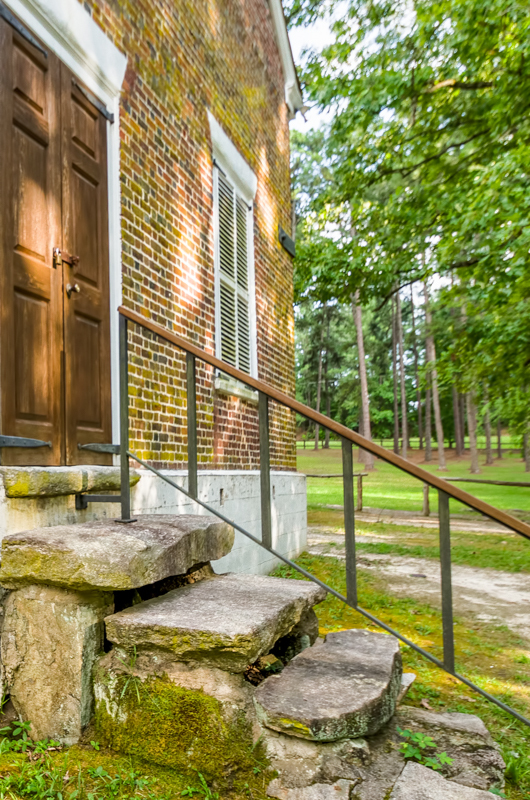 The rough, fieldstone steps were laid at the front door of Kiokee in 1808 and they are still functioning as designed after over 215 years in place. Why the Baptists choose to erect this classic, monumental brick Meeting House and then provide such a rude and rough entry- way is a mystery to us. Perhaps it was to remind the parishioners that simplicity and unadorned function were the bywords of that faith and make each entrant 'stand on the rock' every time they entered the church. After climbing the rock steps and walking into the building, this is the view that greats a congregant; a spacious, safe temple with chamfered columns, featuring "chamfer stop" detailing, that support a large gallery above. The hand made pews rest upon a sound floor of heart pine boards cut from the nearby forest. The thick plastered walls rise to a high ceiling and light floods the room from the very deep, set back ,clear glass windows that line the side. Imagine how comforting such a bastion as this would be for any who entered. This would have been the most striking building of any kind within many, many miles. When you walk forward to the chancel, you cannot help being impressed by the almost Spartan simplicity of this church. The windows are simply framed, though particularly striking because of the deep set-back caused by the very thick brick walls. The plastered walls rise from a paneled wainscot to the ceiling with no decorative embellishments. The altar is plain and straightforward. No special seating/benches are in place, just the same as for all others present. We are impressed by the effect that the 'Trinity' of the three windows behind the chancel creates. The elevated window in the middle and its relationship to the pulpit leaves little doubt, this was a very intentional design element. When one steps to the Pulpit, the back lighting provides a halo-like illumination that gives the preacher quite a presence. The three generations of Marshalls that spoke within these walls must have been something to see and hear. 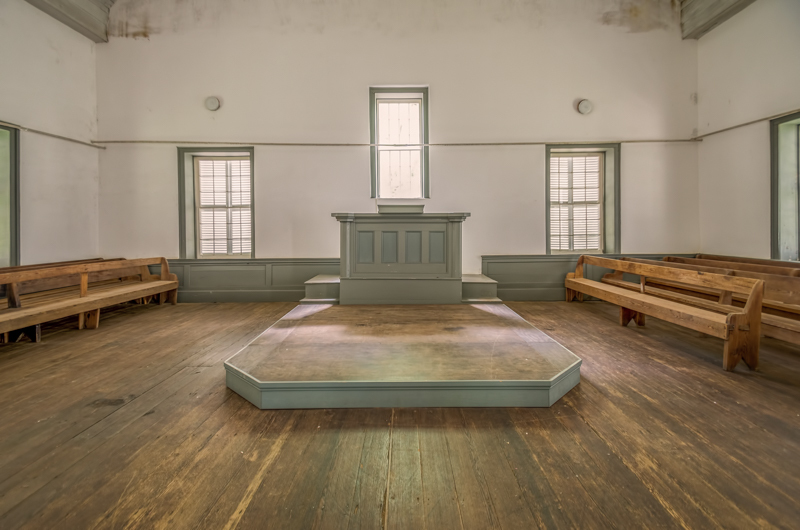 This view from the pulpit emphasizes the solidity and strength that is the Kiokee Meeting House. The wide span, vaulted, wood-slat ceiling defines the worship place. Giant cross beams sit atop all four thick, solid brick walls. The gallery is reached by symmetrical, ascending double stairs and supported by nine, stout columns. The thing that came to mind when we saw this was the hymn, 'A Mighty Fortress is Our God'. And, in fact, Kiokee as well as other early rural churches was not just a place of spiritual refuge but a physical one as well where people often fled when threatened by outlaws, Indians, storms and other disasters. This is an interior-side view of one of the side doors at Kiokee. The floors and doors are all made of old, heart pine lumber. These trees were at least several hundred years old when they were harvested in the late 18th-early 19th century. Thus, the door you are looking at is made of wood that is, today, probably a half a millennium in age! This is tough and long lasting stuff. Just as unique as the wood are the articulated iron strap hinges. 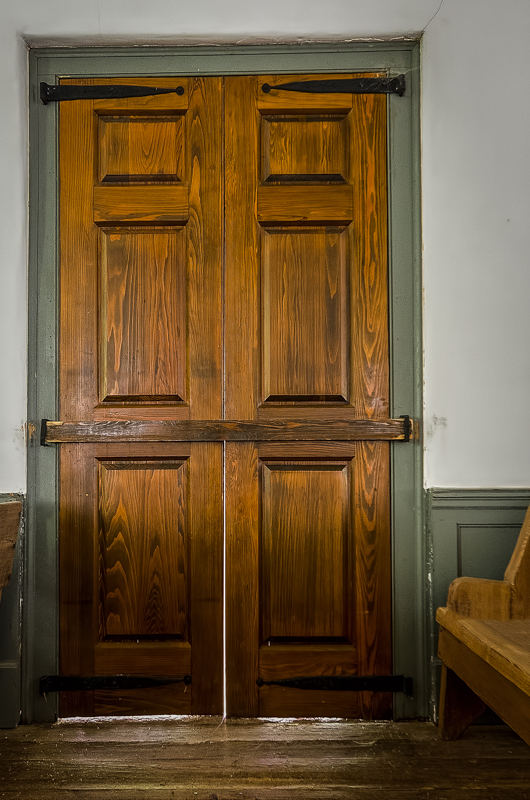 These hand wrought hinges were no doubt made on the place by skilled workers and still function as well today as they did when first hammered into shape around 1808…..Thomas Jefferson was just ending his second term as President when this still beautiful door was framed and mounted. We pulled this original pew into the light of one of the side doors so you could see and enjoy the craftsmanship and joinery that went into its making. 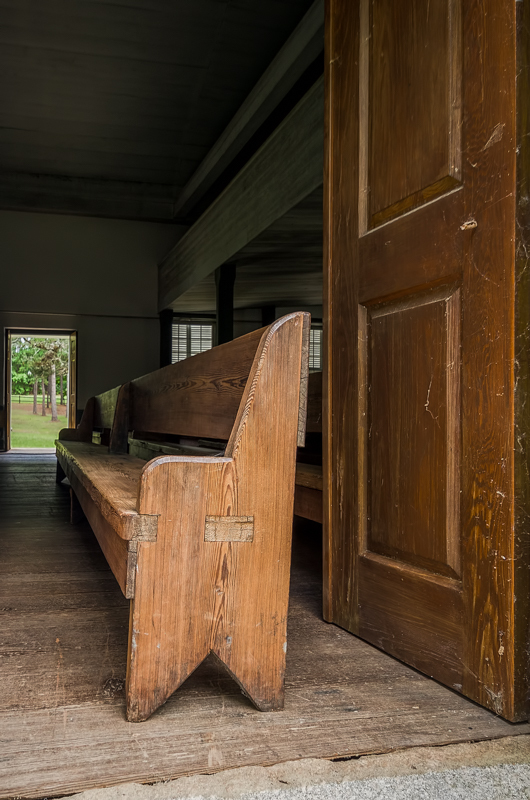 Wide, single boards of varying thickness were used to create these pews. They were constructed using mortise and tenon joinery (mortise is the hole cut in the side of the pew with the tenon cut from the pew seat inserted into the mortise). They are still perfectly serviceable 200 years later. We all need to encourage and foster preservation of places like Kiokee, and items such as this pew, for all to be able to see and enjoy for another two centuries or more. This memorial is dedicated to the Marshall Family, many of whom rest in peace here in unmarked graves. It is placed at the Marshall Cemetery at Kiokee. It serves as a cenotaph for the family since their exact burial location is unknown. 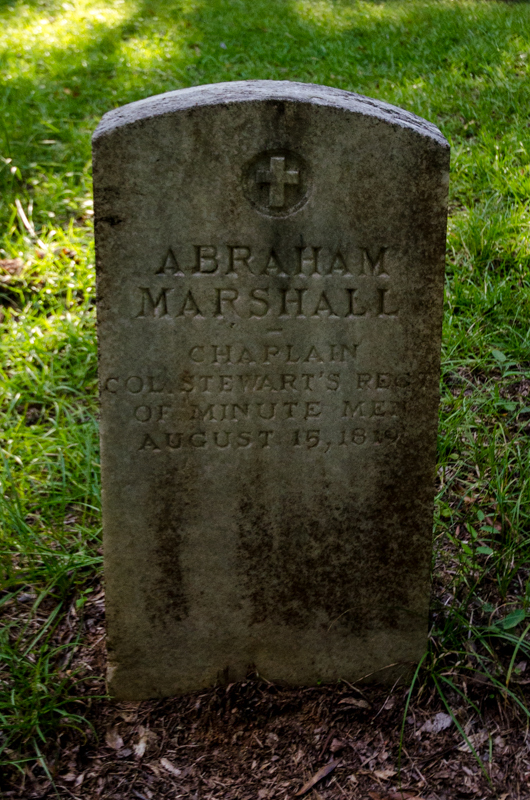 Here is the grave stone of Abraham Marshall, son of the founding minister of Kiokee, Daniel Marshall(1706-1784). 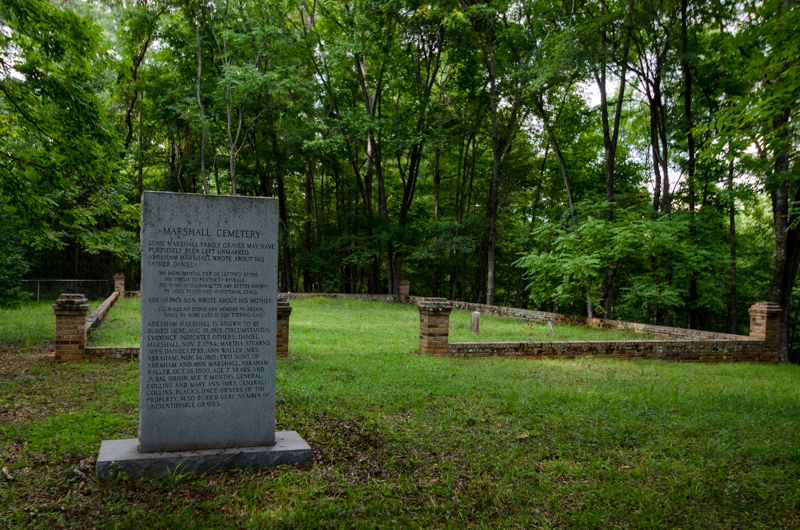 Abraham was the pastor of Kiokee when this Meeting House was built in 1808 and served until his death in 1819. As you can read on the official U.S.Federal Army marker, it is interesting to see that he is remembered as 'Chaplin, Col. Stewart's Rgt. of Minute Men' rather than as beloved pastor of Kiokee. He was succeeded by his son, Jabez, who served until his death in 1832. The Marshall's shepherded the Kiokee flock for its first 61 years. Well done thou good and faithful servant. It is sometimes difficult to really feel the power of going back in time and the special emotions that come with this journey. Progress usually rears its head with too many elements of the present in close proximity. Kiokee is a total time warp that sits largely unseen and unknown today on a quiet, isolated site in Columbia County where it all started. It is still well maintained by the congregation of the Appling church nearby and occasionally used for special church events. We should all be very grateful to them for their excellent stewardship of this sacred place. Kiokee was simply one of the finest churches ever built in the Georgia backcountry and we are so grateful that the image above properly speaks to us of days gone by.